UK and many others. This will be the final Colorado event before the Wolfpack Ninja Tour takes the sport national in 2018. The Wolfpack Ninja Tour welcomes athletes from ages 4 and up to train, get active, and gain confidence through completing the Ninja obstacles and numerous activity stations. Amateur Ninjas with backgrounds in OCR, Spartan, climbing, parkour, endurance sports, as well as athletes from more traditional sports, will have the chance to test themselves and qualify throughout the weekend for a spot in the Finals Competition where they will compete head-to-head for over $50,000 in cash prizes. Additionally, the event offers group and personal training opportunities with fan favorite professional Ninjas. This is the only event of its kind in the country where all the top Wolfpack Ninjas Pros will be present. Sign up for the Ultimate Pass experience which includes, among many other benefits, a 1-on-1 training session with a Wolfpack Ninja Pro of your choice! Participants should register for competition waves and buy Ultimate Passes (only 50 available!) 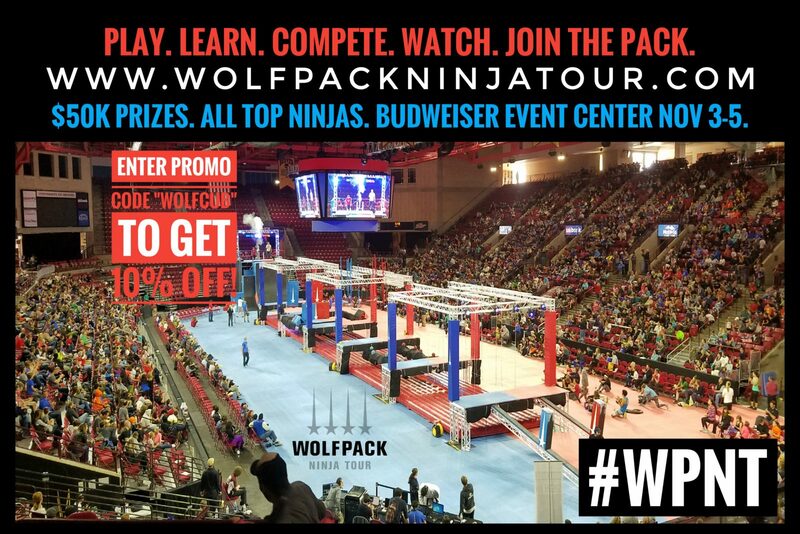 at www.wolfpackninjatour.com. Pre-Event registrants will be given a first look into the challenges the obstacle course presents, and will be offered unique insight and training tips from the Wolfpack Ninjas on how to best prepare for the course.